Image taken Feb. 26, 2005, near Winkleman, Gila Co., Arizona. 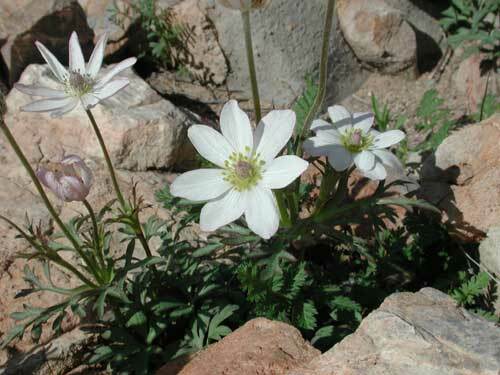 FLOWERS: White flowers with 5 to 10 sepals, numerous stamens and numerous separate carpels. Growth and flowers only in early to mid spring. PERENNIAL HERB: Above ground portions are entirely herbaceous growing from under ground tubers. These soon die back with onset of hot temperatures. 10 to 20 cm tall. RANGE: Common in the Sonoran Desert of Arizona and Sonora on rocky bajadas. Texas and across the Southwest to California. LEAVES: Palmately cleft leaves are somewhat fleshy. FRUIT: Each carpel developes into a one-seeded capsule, or achene.